HomeNigeria: Why do we need the Reformation? Nigeria: Why do we need the Reformation? 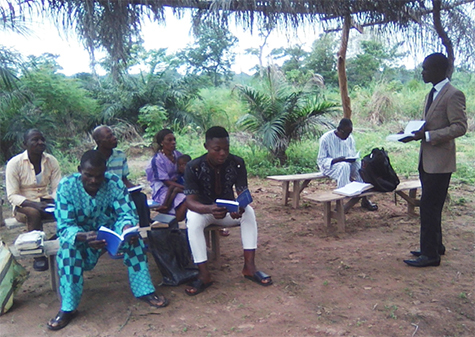 Mr. Joseph Oko Wonah, a Lutheran lay preacher, teacher and a youth leader in Nigeria, uses LHF’s translation of Luther’s Small Catechism in the Yala language to catechize new people in the Christian faith at a new congregation in the village of Ijama. Why do we need the Reformation to come to Nigeria? For the same reason that Dr. Martin Luther offered his solution some 500 years ago, when he undertook the task of translating the Old and the New Testaments into his mother tongue (the German language) and when he wrote the Small and the Large Catechisms for the common people to read and understand matters of faith and salvation. Dr. Luther brought God’s Word of Salvation through Jesus Christ to the people in the language they could understand first hand. It is beneficial to continue in this legacy when you consider (as Luther did) all Christians to be priests, who will by themselves declare the praises of Him who called them ‘out of darkness into His wonderful light’ (I Peter 2:9). Our Lutheran Christians in Nigeria need to have the correct understanding on issues concerning faith and salvation and to be in a position to share the same knowledge with others. The best way to tackle this is to have our Confessions translated in our mother tongues, and the Lutheran Heritage Foundation has emulated Dr. Martin Luther (who first did it) by addressing the same issues in our time. We passionately use the translated Confessions in the Yala language for catechizing people into the Christian faith, and we continue teaching them to remain steadfast in the one true faith. We also use them in our continuing education classes with our lay pastors, in order to enrich their preaching in local congregations – a kind of goal Dr. Martin Luther achieved through his Small and Large Catechisms. Our Confessions (as contained in the Book of Concord) are based on God’s Word and brings out clearly the Bible’s most important and comforting teaching of justification by grace, through faith alone, on account of Christ alone. It is therefore imperative that we Nigerians and all people have our confessions translated in other tongues for the spread of the Gospel of salvation.